Thanks for your patience with me as I’ve finished making two books this summer, attended my first Worldcon, got engaged and been put through the wringer with health and personal issues. It’s been a wild season, but I can’t wait to finish the story off with you all! Second, been quiet because I’ve been working on like 3 books and 2 campaigns (fulfilling one, planning the other) over the past 4 months, as I’ve mentioned a few times… I also had to increase the number of pages in Mare (posted in the last KS backer update) so it ended up being a bit more work than expected, but will also have a longer finale than I’d original expected. Finishing a book is HARD. I’ve never done it before and didn’t realize how hard it is. Every cell in my body says don’t do this to them, don’t end the story, haha. But it’s nearly there, after many months of editing we’re sending the books to print in August. Late, yes, but I’m finally happy with it. I will be fulfilling all of the KS books before fulfilling preorders, but if you missed the amazing Kickstarter you can preorder the PDF or book for delivery in early 2019. If you’re holding out for a signed copy or any of the limited or hardcover tiers, those will be listed next year when I take stock of what rewards I have left. Third, the Elements Anthology won an Eisner, so now I’m technically an “Eisner winning artist,” haha. My comic, Pulse, is posted for $2+ Patrons and up and is on Gumroad too if you like spending more money for less content. Personally I’d just buy the book cuz it’s got like 15 billion awards now. Finally, it’s just a fact of life that things take time to make, I want to make them, but I am one person who has never done most of these things before. Thanks to those of you who keep coming back to visit, but to save yourself the trouble, just use the RSS or the email notifications and I’ll bug you from my end when new stuff goes up. The comic updates will probably resume in Sept after SPX and after the KS for my next project launches. Once that project is off the ground I’ll be able to start updating here again with the final 35 whatever pages and finish this thing off for good. As usual you can yell at me here but for the best yelling I suggest going to Twitter, where you can yell at me where I’ll get to see it and feel bad right away. ANYWAY! Don’t burnout! Take the time off if you need it! Your health and well-being are more important. I understand it as being from Threvi, and understood only by Bex (as in panel 2); she’s just not translating it for Mike in that panel. Maybe because she thinks it’s not relevant, maybe because she’s just listening instead of translating concurrently, maybe she translated it between panels 4 and 5. I think panel two picks up after Bex has started translating, and we see that Levi is speaking in the bubbles without quotations marks, and Bex’s translations are with quotation marks. I think what Levi says in panel four gives Bex pause for thought, and she doesn’t translate it. Maybe out of kindness for Mike. She might not want to raise the issue of how crazy and unpredictable human minds can be, for various reasons. To Bex’ brain, Levi’s vocalisations directly register as English, right? So here she just repeats what she hears – i.e. for her it’s not really “translating”? Me too. But I really look forward to plung into “the Meek'” with a vengeance. Great things are looming ahead! Just want to say you are doing awesome work, and that I am eternally grateful for you and your comics! Don’t think so. Threvi would attack her head if she tried something like that and really twisted the message. I tell you, that immediately crossed my mind too. But as much as Bex wants out, I don’t think she’s the type who would lie to make that happen. …To me Bex seems to me like a *terrible* liar, have I forgotten an instance when she lies plausibly? Since there are no microchips in Threvi, his mind is a copy of the original, not literally the original. So it’s kinda obvious that The Original had to be, khm, destroyed. And he wouldn’t have memory of it, since the copy was obviously made before it. The decision to destroy The Original LEVi might’ve been made (or rather, announced) by Processor already after the copy was made. And it could’ve made Kalla mad, so Processor had to kill/reset her too. Thus she won’t remember. 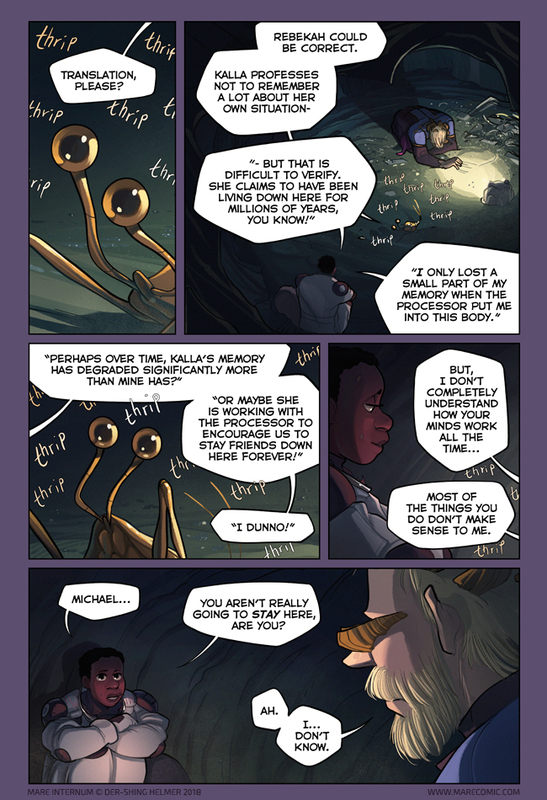 I started reading this comic when it first came out, lost track of it for a long time, and just archive binged the whole thing over the weekend, pleasantly surprised to find out I’d made it back before the comic was completed, but saddened to have juuust missed the kickstarter. I don’t have all the words for what I’m feeling, but I did want to say: thank you so much for sharing this work. It’s so beautifully done, and means a lot to me on several different levels, as a queer person struggling with mental illness, as a woman who wants more of an identity than being a mother and is frequently disappointed but not surprised to see the way people are so often ready to attack a woman (especially a woman of color) for not making the choices that have been ‘traditionally’ expected of them, and just as a person who adores not only how much you put into this comic, but how you interact with people in your comment section in such a sincere and patient way. I don’t know; I’m worried this will come off weird and convoluted, so tl;dr: I really love your work and appreciate you sharing it! Especially Kalla and Threvi, who are perfect in every way and their friendship is the best. :) Congratulations on all the cool things you have going on! Take all the time you need with finishing the comic! With so many tasks at hand I’m super impressed you’re able to manage it all and still have steam to draw, don’t overwork yourself. I have this horrible thought that, at best, Kalla has lost a lot of her memory by being rebuilt by the Processor many, many times over the millenia — a little bit lost every time it reincarnates her. Because surely as an organic being, any single body can’t last forever. An even more horrible thought is that the Processor chooses how much memory to to put into Kalla’s body each time. But we also know that any memories made after the time of last contact with the neural sea aren’t “backed up” and thus can’t be transferred. Martian reincarnation is a lossy file format. Given the Processor’s powers of duplication and simulation, I’m starting to wonder about who might return to the base, and what lies the staff at the base might be told about the interior of the volcano. Given the processor’s powers of duplication as shown on that flower, I doubt he can do convincing humans. Well, that depends … The flower was created on VERY short notice. But New LEVi has held up quite well. Was New LEVi created from scratch, or merely downloaded into an existing organism? And Kalla’s body — repeatedly re-created — was made out of meat. It’s hard, when all you have to go on is reading someone’s mind. It’s a bit easier when you have access to an individuals DNA. You are great, thanks so much for doing what you’re doing! It’s nice for them to finally get a calm, relaxed discussion for once. Yeah, I just noticed that in the second panel, Mike seems to be lying on his stomach and playing in the dirt. I have to wonder what Mike has on offer to go back to. His family is kind of a mess, his job prospects are a dumpster fire, and he’s not quite human, anymore. Mike can’t leave anyway, he doesn’t have a helmet. Unless thighfriend can process extremely attenuated CO2 into blood oxygen. That being said, I can’t even blame Mike for not wanting to leave. Even if he biologically could, though that’s it’s own discussion. He was close to killing himself, hated himself, and now he’s discovered a while new world and is literally covered in life, and feels a part of something. He’s lacked that his whole life. The way he’s adapted is telling of the peace and acceptance he wants himself to have, whether or not he he truly wants to leave. Character development, man. Regarding Kalla’s memory after an unknown number of reincarnations, how complete it may or may not be, it might be worth considering the Struldbruggs of Luggnagg, described by that noted observer and narrator, Lemuel Gulliver. These near-immortals underwent progressive memory decay, so the older ones have no real idea of their actual age; Gulliver recounts that the most reliable method of estimating age is the ask them, who is the monarch? which tends to produce a guide to their coming of age. The older ones are increasingly isolated by progressive changes in language, so that many of those over the age of 200 or so cannot understand contemporary speech. hey! you’re doing an amazing job, der! we all believe in you, hopefully life gets less stressful soon! Appreciate the update! Take care of yourself. Just wanted to say, take it easy, your health is ( or at least should be) your main priority. Good things come to those who wait, I have no problems waiting for your next update ;) . Great comic (I think I told you before). It just dawned on me that this could be quite a significant statement. As it implies that Kalla’s memories have degraded a lot during the period that Thrip/Levi was down there. This makes me suspect our protagonists might have been down there for a lot ( A LOT) longer than they realise…. take care Shing, hope you’re well. Looks like the European Space Agency’s MARSIS discovered an underground lake! No word if its populated by thigh friends, thrips, or Wollarians yet! Didn’t you do the Meek book though? Perhaps the difference is that this is a complete *story*, whereas the Meek book was Volume 1, with more to come. Is that correct? That story is not over, so yeah I guess technically some chapters are collected into a book but the stakes are non-existent compared to finishing off a complete self-contained story. Yelling is so nice. I like me a good yell. Good to see an update, but please make sure you don’t burn yourself out! The way I look at it, worse comes to worse it’ll be an awesome Christmas present to myself. Hopefully it won’t take that long, but if I can wait patiently for a delayed game I can wait patiently for an amazing piece of work. Hope you take a day or two to yourself and enjoy the summer holidays. This comic was the first thing that popped in my mind reading the news about the underground sea on mars. Thank you for the update! I was super broke during the Kickstarter but I definitely want the book, so thanks for linking! Take all the time you need to make this as great as it gets. I’ll wait as long as Kalla if need be. Most of all, take all the time you need for yourself and for having fun creating. Shing, I was concerned you’d gone and burnt yourself out with all of the stuff you’re involved in. I’m not really angry, let alone going to yell at you*. *This is a lie. I am perpetually angry at literally everything. Hi I’m here to yell at you but in a good way, your comic is good and I love it and I’ll wait patiently for whenever you’re able to return to it. Happy Birthday! Looking forward to the continuation and conclusion of your project this month. Good Stuff is worth waiting for! Carry on! Let’s just think of it as how much is we love your work; we’re always eager for more! Let’s just think of it as how much we love your work; we’re always eager for more! Sorry about that, ended up needing to prioritize another project… Schedule got pushed around a bit due to illness. Haha, it was not meant as pressuring the author. I love this comic, and am eager for it to start again. It has regularly updated with, imo high quality artwork and an intriguing story. That was what I meant with my tongue in cheek remark ( I can understand it came over a bit cheeky…). Of course I am not entitled to Dersingh keeping her self imposed deadline. I will happily wait for whatever amount of time she needs/wants for her break. I have no doubt it will be worth it. Don’t worry if it’s October or even later Lass. I love your work ethic, and I love you more. A tradesman is only as good as his tools, take care of yourself. Well do as you please of course, that’s just my uncalled for request. I don’t know if anybody is looking here but the Electrum anthology is on KS now! Is this comic going to resume during the Electrum kickstarter? Never mind this comic. Is The Meek ever going to resume? Yep, but I’ve got a lot on my plate that needs to be cleared before I can get back to it. Great to hear that! Any rough ETA for The Meek, maybe? It’s my all time favorite and nothing else managed to fill the void. I followed it for years (never commented before because public comment spaces are terrifying), and I’ll remain a loyal reader whatever happens. Also, sorry if I sounded pushy or rude, it honestly wasn’t my intention, I’m just bad at English and wording my thoughts. Obligatory good luck with other projects! And take care of yourself, of course. The ideal is early 2019. Tbh it’s been on my mind the most of all my projects (grass is greener, I guess) but I’ve got to hold off on production until my schedule is fully cleared. Thank you for the clarification, very kind of you. Best of luck, hope everything goes as smoothly as possible. I definitely love this comic but I think I have been spoiled by more productive authors (like Ashley Cope with Unsounded.) I cannot even imagine what a task it must be to try and juggle a personal project of this magnitude but it is a little disappointing when all of the self-imposed deadlines the author states just turn into empty promises. Feel free to contact me directly if you have a problem or would like a refund, or something else. I don’t know what to say to you except that I’m having a very rough few months, am pushing through it to the best of my ability, but at the end of the day I am one person in a lot of pain who is doing their best to keep moving everything forward. Status updates are coming as much as I’m able to give them but coming here to get abused by strangers I have been posting a free comic for, for years, is difficult. I’m absolutely more than happy to return your KS money if you think my work or the book is not worth it, but please understand that I’m a human being who is going slower than usual at the moment because of life circumstances and not because I am trying to disrespect my readers. Thanks, and again, feel free to reach out in any of the various ways you can PM or email if you’d like some sort of specific action on my end. I have empathy for what must be an arduous project to take on and in no way meant to imply that I was looking for a refund. I had not thought that casually expressing in a tactful manner my mild disappointment within a comic’s open comment section that exists to allow for such constituted abuse. I look forward to seeing how this story and its characters reach their conclusion, and wish you luck in your future projects, hopefully which will be easier on your spirits and in forms more suited to your faculties. Hey Roo, I apologize. You’re right, you specifically were not being abusive. I was a bit too emotional in my reply having come back to some actual abuse (since deleted) at a bad time, and your reply was “normal” enough that I felt it warranted a reply. Unfortunately I responded inappropriately. I’ll do better not to respond like that to you or others in the future. Feel free to contact me on the KS if you have a KS related question (since it’s a bit easier for me to make notes and keep track of things within that system vs trying to remember who I’m talking to on this site and cross-reference). And if you just have general comic comments please feel free to keep commenting here.